CSB-40 - CSB Sliding Bearings India Pvt. Ltd.
resistance over the common CSB-50 range under lubricated operation. 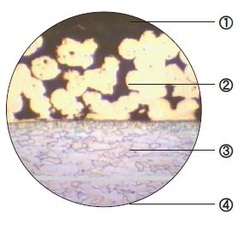 mating surfaces of the bearing assembly, forming an oxide type solid lubricant film. 2. Sintered bronze powder thickness 0.20-0.35 mm, provides max. thermal conductivity away from the bearing surface, also serves as a reservoir for the PTFE mixture. CSB-40 is developed for high duty, oil lubricated, hydraulic applications...Automotive suspension struts, shock absorbers guide bushing, hydraulic cylinders, gear pumps, motors, axial and radial piston pumps & motors. CSB-40 is designed mainly for using under lubricated conditions and it performs excellent wear resistance and low static/dynamic friction coefficient.